This is me standing in front of a collage I made in college that is still hanging on my wall is that weird? This is me on the day it was 21º after going to my friend Logan's awesome dance performance. I wore my new shoes. 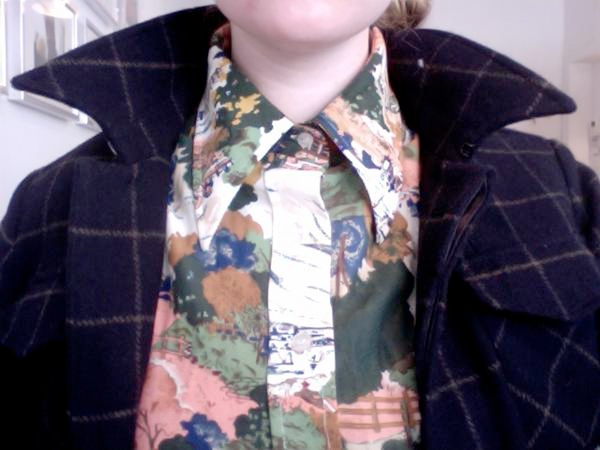 This is my new shirt that has a pastoral scene on it and it's vintage. This jacket is from Opening Ceremony. These are some random pictures because I don't have many good pics from the last week. I'm going back to Portland on Sunday! Hooray! Right now I'm watching Stella. Random pics are so necessary sometimes.